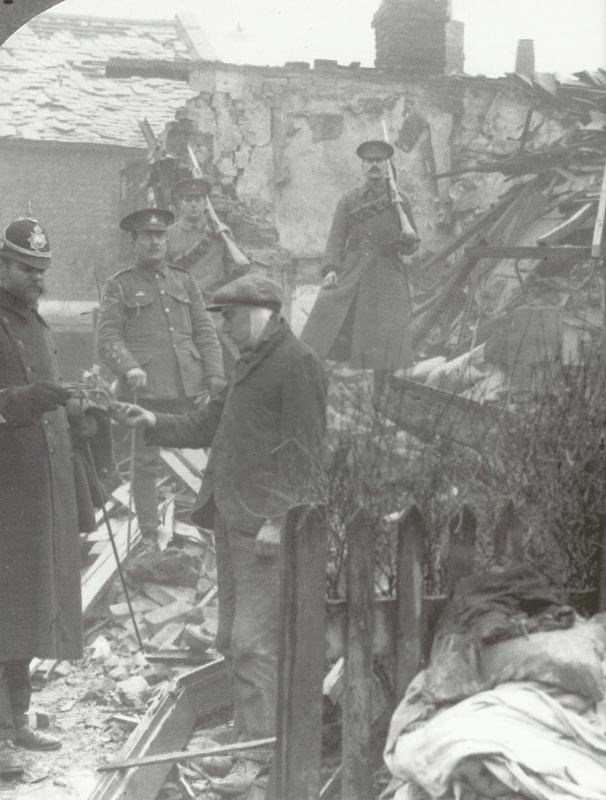 A British home lies in ruins after a Zeppelin raid. Britain: German air ships L14 and L22 bomb Leith and Edinburgh (aiming for Rosyth naval base and Forth Bridge); 37 casualties from 44 bombs (night April 2-3). Western Front: 20 Anglo-German air combats (3 German aircraft thought to have been hit). Verdun: German advance in Caillette Wood (Douaumont­-Vaux) and approach Fort Souville. Germans repulsed in Liakhovichi region. France and Belgium: ­OHL notifies 5 Army HQs of intention to raise 50,000 forced labourers. Sixth Army orders Lille Governor on April 11, 1,400 workers impressed per day from April 22. Holland: Raemak­ers’ cartoon ‘The Last Throw’ (Kaiser and Crown Prince dicing with death) in Amsterdam Telegraaf. Munitions factory explosion at Faversham, Kent kills 106 people.